Spring exploded in almost vulgar splendour. One evening I relished that “vulgarity” out of the window of the back studio as I glanced up from some writing. Some of my less kind friends would mock the candy floss pink of some azaleas, demanding instead a more muscular garden, whatever that may be. Hmmm. Of course that is also a criticism of my work. But above all I believe as artist and man that I be honest. I recently tackled a more painful aspect of that honesty, the loss of faith or belief. I received a phone call from a man in Canada who was once a Mormon Bishop. Gradually he permitted himself an honest look at his religion, so dear to him and his family. An excruciating ordeal evolved as he risked so much pain for himself and others in order to scrutinize his faith. He asked me to explore that experience visually. I did not expect it to be difficult because I too had traveled that path. But it was and remains enormously complex. I have struggled with the work for months and the result is as loaded with as much doubt and pain as such an ordeal. At least that is the way I see it. It is not a harmonious work in a way. I always allow the work to dictate itself to me and this was not an exception. A kind of discord is the result I suppose. I call the piece, Dark Light. My first thought was of the wonder of religion, the seductive and endlessly warm and enriching gift of a community of like-minded people. My own loss remains so fresh in my heart all these years later. I don’t know if I am quoting correctly, but someone said, “loneliness is a terrible price to pay for honesty”. Very true. But the loss of integrity is also a terrible price to pay for insisting on living with questions that deny reason. What an excruciating torment. The first note of the work was to explore the gestures and sense of being in the beloved prison that in my mind is represented by faith in dogma, whether acquired along the way as in my case, or inherited from generations of the faithful. 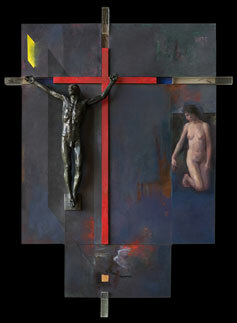 Gradually I came to identify the potency of the crucifixion to express that anguish. It is not only an expression of Jesus’ torture but suggests also the agony of human experience, especially in matters of thoughtful faith as well as painful life. But there is a sense of peace in the honesty of being stripped of the cultural trappings of inherited life and facing existence as experience anew, open to and entranced by the scrutiny of a hummingbird. The moments with the birds in my garden, give me the strength to deal with the demands of life, such as my explosively energetic little grandson with whom I share a home along with his mother. Bliss in the garden translates to the bliss of being part of family and to friendship, though the translation is hugely complicating. I relish the bliss of both.